Seizure Tracker - Recent upgrades to the site. Epilepsy Related Diet History Tool (includes: Ketone and Glucose monitoring) - The new diet tool on Seizure Tracker enables users to collect and share their diet history along with ketone and glucose levels. Track and Graph Daily Variables - Record and track daily variables that may effect your seizure activity on Seizure Tracker. Create reports that graphically illustrate what time and day these variables occurred. VNS settings history feature on report graphs - The new VNS settings history feature on the Seizure Tracker report graphs allows for easier evaluation of VNS setting changes against seizure activity. The NEW Seizure Tracker iPhone / iTouch / iPad APP is here! - Now you can time and videotape seizures simultaneously in this revolutionary and simple to use application. Menstrual Cycle Tracker - Track Basal Temperature, Progesterone Level, Ovulation, and Menses. Information collected can be represented on the report textually and graphically. Seizure Tracker - Epilepsy medication blood level tracking. - Record and track your epilepsy-related medication blood levels on Seizure Tracker. Create reports that graphically illustrate when blood draws were done and what the levels were at a the time of draw. VNS Settings History and Magnet Swipe Tool - New tool on Seizure Tracker enables users to collect Vagus Nerve Stimulator Settings History and add Magnet Swipe information to events logged on the site. Mobile Rescue Medications and Daily Notes - New functionality added to the Seizure Tracker mobile logging site include: Seizure Rescue Medications and Daily Notes. 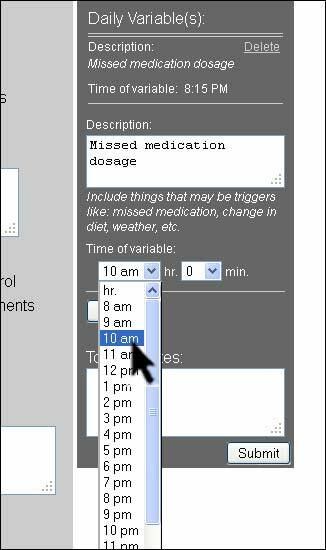 Hour option added to seizure log - Hour option added to event logging page and allows for logging seizures up to 12 hours. Log Seizure events from your mobile phone - Seizure Tracker users can access their accounts through a mobile optimized web site. "Time of Day" Graphs - Graphs let users of Seizure Tracker compare event counts by the time of day they occurred.